The win is the biggest in the UK to date and saw the lucky punter beat odds of 76,275,360 to one to choose the right five main numbers - 9, 30, 35, 39 and 46 - and two lucky stars, 6 and 8. It is unknown whether the winner is an individual person or a syndicate, as they have not yet claimed their prize. 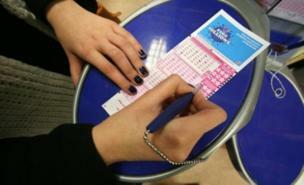 The previous biggest UK lottery winner - who remained anonymous - scooped a EuroMillions jackpot of £84.4 million in May. Whoever the latest record-breaking winner is, they will have more money than superstars such as Barry and Robin Gibb, Rod Stewart and David Bowie when they pick up their prize. 'This is fantastic news - we're absolutely delighted to have such a massive UK win,' said a spokeswoman for Camelot. 'We have plenty of champagne on ice and are looking forward to welcoming the lucky ticket holder to the National Lottery millionaires' club,' she added. Those who matched five main numbers and one lucky star will be able to claim £521,015.20 each. Last night's game saw technical problems that resulted in some people being unable to buy tickets. This was due to a glitch in the connection between Camelot and certain banks that lasted for half an hour.